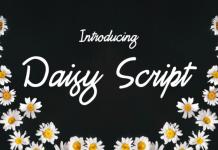 This free font called Olivia Script. It’s a modern calligraphy typeface, which is both sophisticated and graceful. The script font comes complete with 351 glyphs. It’s a perfect font for purposes such as Wedding Invitations, Greeting Cards, posters, wall hangings, gifts and much much more.